Avoid the headache of creating a beautifully coordinated look for your bed with this 8-piece Navy Bed-in-a-Bag from Carson Carrington. Featuring complimentary patterns with a stark white on navy contrast, this bed evokes imperial elegance that will impress anyone who sees it. Dry clean preferred. Machine washable, use front loader machine (or top loader without agitator) to avoid tearing. Use Cold water in gentle cycle, tumble dry low heat, adding 2 tennis balls in the dryer will add fluffiness. Can't give 5 stars because the sheets that come with it aren't actually a part of the set. Just bright white that slide off mattress easily. Comforter is nice. True navy. Only downside is it collects any and all lint and fuzz. Comforter keeps you warm! I bought this for my son to freshen up his bedroom. It is a great navy blue color and looks like I paid more than I actually did. The comforter is light weight which is good because we live in Florida. I believe we will be able to use it all year long and not just one season. I just bought this set and the color is beautiful. This is a quality comforter and design makes it look expensive. All the accessory pieces look great and the sheets have an unbelievable feel even after washing. The very soft fitted sheet fit perfectly over 10in foam mattress and 2in mattress pad. Color is as expected from the picture. I must admit I get nervous to purchase bedding items on line. However, I read previous reviews and felt convinced to order. This comforter is as pretty as it looks in the picture. It is soft and warm! I love the look and happy with the quality and price! Would recommend to anyone! Great comforter set. Has shams for larger pillows (not standard). Comforter has been washed a few times. No complaints. Kept us warm during those midwestern winters. Very nice bed in a bag. 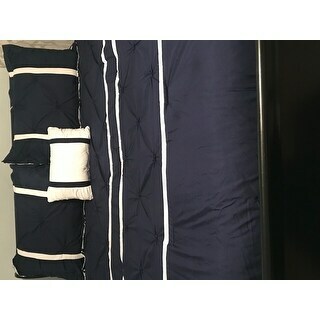 The comforter is very lightweight and easy pull across the bed. The entire set is visually appealing. I really like the contrasting designs. Bought this for my son's room and it looks great! Perfect weight and comfortable for him to sleep! I like that it came with even a few decorative pillows! Love my new bedding, the shipping was fast, the bedding is super soft and comfortable. I especially like that it's reversible to give you two different looks. Damaged in transit. Very cheap feel with very little fill. Don’t waste the money. Nice light weight comforter and pretty color with our gray walls and carpet. My daughter picked it out. She is 13 and wanted to get something more"adult" to redo her room. This product had everything that I needed. I love the Bed in a Bag sets. The colors and patterns were simple, yet fun. "What color is the sheet set?"